There is a fire burning in South Buffalo that was sparked generations ago. Today the descration of sacred indigeneous grounds has rekindled by the acts of the Maritime Charter School, The city of Buffalo, and a developer named Paladino. One of our most important historical places is located on Buffum Street, just off Seneca Street near Cazenovia Park. It is here that we have the small city park called Seneca Indian Park. The land was given to the city of Buffalo by Mr. and Mrs. John D. Larkin. This occured after a serious and egregious act of defilement occured related to the dismemberment and removal of the remains of Red Jacket. This Seneca leader had been interred at the site along with others such as Mary Jemison aka the White Woman of the Genesee. The site had been central to the Buffalo Creek Reservation, a place to which Seneca and other Haudenosaunee people had been relocated after George Washington and General Sullivan seized and burned their lands in the Genesee Valley. It was on this site that Millard Fillmore helped to plant the Black Walnut trees that remain to this day. It was adajacent to this site that Red Jacket lived in his cabin for many years. It was at this site and along these streets that people including Mary Jemison would walk from Letchworth and Gardeau Flats to attend to business at the Longhouses on the Council Grounds or in the growing villages of Buffalo and Black Rock. It had become a burial ground because it was a sacred place, a place where others had been before. It was a place of an ancient settlement, long pre-dating the Seneca. Today’s Buffum Street and the Seneca Indian Park is on the site of an ancient Middle Woodland Period Mound and village dating as far back as 1,000 AD. It is one of the earliest known human settlements in this area. Later, there was a walled Iroquois /Wenrohronon village here. By the time the Buffalo Creek Reservation was created in 1797, the people knew where the power sites were. What we know call Buffum Street and the Seneca Indian Park was one of them. And then there was the Seneca Mission House. This christian school built here by the New York Missionary Society was dropped here just after the reservation was established. It succeeded in converting many of the indigenous people to the christian faith, and for several decades, when they passed on, they were buried here. The Buffalo Creek Reservation was chopped up and sold to the whites, much like the desecrated body of Red Jacket. The small Seneca Indian Park is surrounded by what is a much larger sacred space that includes the interred bones and spirits of the peoples ancestors. If you live in this neighborhood today, you know how powerful those spirits are. Today, the Ellicott Development Company, The Maritime Academy, and the City of Buffalo are in the middle of the latest mess. It is starting to burn out of control. Take note. We are pleased to bring you two critical pieces about the ongoing fight to recover the dignity and rights of those many local people who where here first and whom were displaced and murdered by the justifications 1493 Papal Bull, “Inter Caetera” aka the conquistador enabling Doctrine of Discovery. 2. Here is the online link to local Attorney Art Giacalone’s October 15, 2018 blog post. With All Due Respect: “Can’t trust City Hall & Chris Scanlon to protect the Buffalo Street Neighborhood. This is a solid overview of the current legal status of the pending Ellicott Development/ Maritime Charter School development on Buffam Street. There is a solid line leading from the land speculators of the 18th and 19th centuries to our current real estate developers and contractors in Buffalo. Robert Morris and his son Thomas, Joseph Ellicott (land agent for the Holland Land Company), David Ogden and his son Thomas, and a few other wealthy men managed to gain control of all the land in New York west of the Genesee River, taking it from the Haudenosaunee (Iroquois) who had lived here for perhaps 1500 years. From controlling 80% of what is now New York State, Native people now control less than 1 percent. How did this happen? In 1779, because most Haudenosaunee allied with the British in the American revolution, George Washington sent a quarter of the Continental Army to destroy the Native villages, farms, and orchards in the Finger Lakes and central New York. At least 40 towns were destroyed that fall; most of the people fled in advance of the assaults, and, without shelter or food in a harsh winter, it is estimated that thousands of them died of starvation and cold. Today this would be called ethnic cleansing. Survivors moved west to Fort Niagara and towns along the Buffalo Creek and the Niagara River. In the following 2 decades, not only the Seneca, but other Haudenosaunee and other Native peoples were also forced off of their lands and moved to the Buffalo Creek area of Western New York. After the terror and deprivation, treaties were signed. But instead of honest, arms-length deals between two sovereign entities, these agreements were products of violence, bullying and fraud by government agents and land speculators, who were often the same persons. The Buffalo Creek Reservation, established by the Treaty of Big Tree (1797), was over 7 miles long and comprised about 130 square miles. It extended from near Lake Erie well into present-day West Seneca. The land was fertile, forested, and well watered; it became a central spiritual and political place for all who took refuge there. Some Natives became Christians while others remained in the traditional religion, but they all shared a council house and governed themselves. 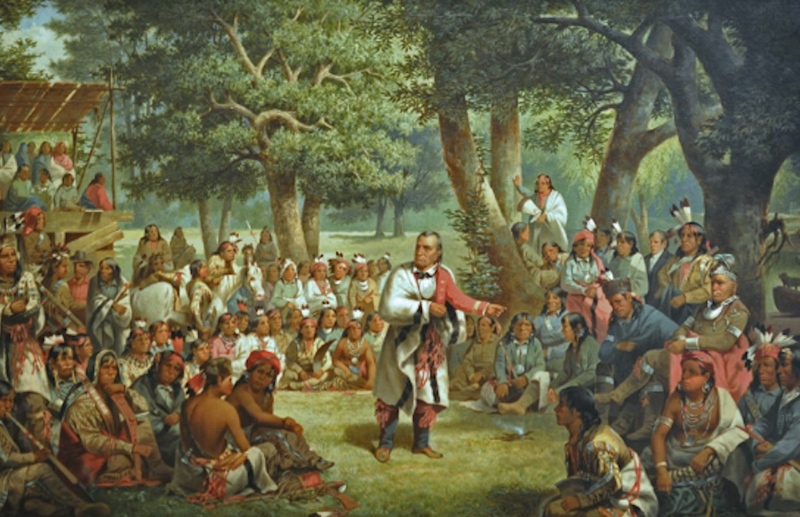 While lobbying for the fraudulent 1838 treaty, the Ogden Company used racial slanders, calling the Natives “depraved” and “half savage.” Although contested by the Seneca, the treaty was finally confirmed in 1842. It forced the Natives to “sell” the reservation to the Ogdens. The Seneca leaders were promised that their sacred burial grounds would never be sold nor defaced, and would remain forever theirs. This sacred land, consisting of approximately 9 to 13 acres, is situated in South Buffalo, in the vicinity of Indian Church Road and Buffum Street. Some pieces of this were sold to white people, but the mission school and church grounds, along with the mounded burial ground, were not developed for years. The church was used as a barn; the burial ground and other parcels were used as cow pastures and fields, a burial ground for indigents, and a croquet field. From 1879 to 1884, fifteen “chiefs” (including Red Jacket) were dug up from the burial grounds, in part because vandals and souvenir-hunters were destroying the graves. The remains were ceremoniously reinterred in Forest Lawn. In 1882 Mayor Grover Cleveland vetoed a proposal to create an “Indian Church Park” because he believed that the Seneca people still owned the land on both sides of Indian Church Road, where the meetinghouse once stood. William Bryant, of the Buffalo Historical Society, objected too, but in June 1884 reluctantly admitted that the Ogden Land Company had somehow taken legal title to the land parcels, despite solemn promises to the Senecas about the larger parcel, which he said constituted about ten acres. Disregard for the sanctity of human remains buried in what was once the Buffalo Creek Reservation did not end in the nineteenth century. In 2009, a Buffalo Sewer Authority mechanical ditch-digger cut through human bones along Indian Church Road. Now the Ellicott Development Company, named appropriately after a greedy land speculator of the 19th century (and owned and operated by Carl Paladino and his son William), has plans to expand the Maritime Charter School on Buffum Street. Their proposal to construct a high school building and athletic facility would result in excavation and construction on the same land that the Seneca consider sacred. Natives and non-Native people should be outraged. Finally, on Wednesday November 28, 2019 the Houghton Chapter of the New York State Archeology Association will present a free and open to the public program at the Buffalo Museum of Science, Cummings Room starting at 7pm. “A Millennium of History and Heritage at the Buffam Street Site and the Buffalo Creek Reservation. Join Alyssa Mt. Pleasant and Susan Maguire as we review the long history of settlement at the Buffum Street Site. Maguire will provide a review of the archaeological evidence for a Middle Woodland Mound with its associated village datng to approximately AD 1000 and a 16th-century Iroquoian palisad- ed village. In the spring of 1780, Seneca displaced by the Sulli- van Campaign of 1779 resettled along the banks of the Buffalo Creek and established a village on the site of these earlier settlements. Mt. Pleasant will discuss the establishment of this village and the formaton of the Buffalo Creek Reservaton. UB Archaeological Survey will have artfacts demonstratng the extensive material culture of the site on display.